Most people want a great smile, and adults know that it can make a great difference not only in their personal but also their professional lives. Many say the payoff is worth the temporary inconvenience and expense of braces. Orthodontic treatment at any age is one of the most fantastic cosmetic dental procedures available today. Although it takes a little longer to complete than many of the other cosmetic dental procedures it has some significant advantages in that once completed it requires little or no ongoing cost to maintain the result for the rest of your lifetime. Moving your teeth can also add youthfulness to your face by changing the shape of your jaw and face, and adding increased support for your lips reducing the need for other cosmetic procedures to the face. The purpose of orthodontic treatment is to make the best of your teeth. This includes allowing you to bite correctly, eat more comfortably and care for your teeth and gums more easily. And your smile will benefit too. Treatment almost always involves using braces to straighten crooked, crowded or protruding teeth, close gaps between teeth and correct the bite of the teeth, so the top and bottom teeth meet when you close your mouth. Treatment usually lasts from 18 months to two years, with visits to the orthodontist required every four to six weeks. If activities like talking, arguing, and making speeches are a crucial part of your career life, you will have to correct your dental imperfections without further delay. Now, would any client wish to hire a lawyer who exhibits slurred speech due to the defects in his teeth? And in case you are a dentist with flawed teeth, won’t your clients question you about your dental defects? Even if you are not a lawyer or a dentist, you should wear braces to fix up your teeth. Of course, braces won’t give you immediate results and you would have to wait for some time to enjoy the outcome. But, remember, in the end you would be able to enjoy your life with a wonderful set of teeth. You will also be able to eat, talk and smile like other normal people without worrying about the imperfections in your teeth. In case you are highly concerned about your image, first remember that your health is more important than your appearance. Now, don’t you feel uncomfortable when you are eating or talking with others due to your imperfect set of teeth? Besides, you will have to wear braces only for a specific period of time. After that, you will also have a perfect set of teeth that will never make you feel self-conscious or worried. So try to wear adult braces if you want to spend the rest of your life without worrying about your teeth. As you already know, today’s society places a lot of emphasis on outward appearance and good looks. So, if you feel neglected in your social circle due to your imperfect teeth, it’s time to correct your dental defects. 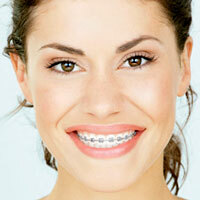 Today hundreds of adults are using braces to straighten their crooked teeth without worrying about other issues. You can also try to achieve better dental health by following their footsteps. Today you can even get ‘clear’ braces that match with the color of your teeth. These braces are also easy to manage and they can even be removed when you are eating or brushing your teeth. So, if you are worried about the reaction of other people, or afraid of the discomforts associated with braces, try to get these adult braces that are more comfortable and even ‘invisible’. And no one else will know that you are wearing braces! When it comes to the different types of braces, you’ll have some control in the choice and so will your orthodontist. In most cases you’ll be given a choice between a few different choices of braces colors and you’ll be able to choose the ones that make you feel the most comfortable with your appearance while you’re on the road to having a better smile and straighter teeth.